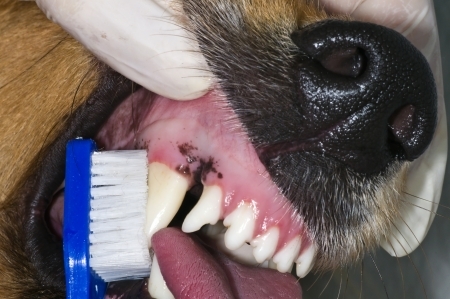 Why is Dog teeth cleaning so important? Well, lets take a look. Puppies have 28 temporary teeth, 14 in the upper jaw and 14 in the lower jaw. These deciduous teeth erupt at about three to four weeks of age. Dogs have 42 permanent teeth, 20 on the top, and 22 on the bottom. These begin to emerge at about four months of age. Dogs have 6 permanent teeth that have 3 roots each, and 14 teeth that each have 2 roots. Periodontal disease is the most common clinical condition occurring in adult dogs and cats, and is entirely preventable with regular dog teeth cleaning. By three years of age, most dogs and cats have some evidence of periodontal disease. Unfortunately, other than bad breath, there are few signs of the disease process evident to the owner, and professional dental cleaning and periodontal therapy often comes too late to prevent extensive disease or to save teeth. As a result, periodontal disease is usually under-treated, and may cause multiple problems in the oral cavity and may be associated with damage to internal organs in some patients as they age. Healthy Smile Pet Dental offers an alternative and safer method to the traditional anesthetic dental dog teeth cleaning. 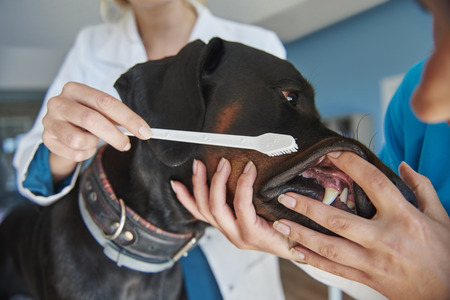 With regular cleaning and maintenance of your dog’s teeth, your dog’s oral health will improve and reduce the risk of certain illnesses in dogs. With a regular dental cleaning we prevent problems before they even begin and ensure a longer, healthier life for your dogs. Our service is a non-invasive method that does not use any medications, sedatives or anesthesia. Our vision is to provide our clients with the safest possible oral cleaning available on the market and are always focusing on preventative care and educating the consumer on the importance of regular pet dental cleanings. We also offer Cat Teeth Cleaning Click on the link to learn more.